As much as the wretched condition allows, I try to acknowledge the upside of MS. Sure, dismiss it as a clichéd attempt to “count my blessings”, but consider the alternative: Endlessly recounting every pain and inconvenience of MS is not only too easy, it’s useless. Worse, I maintain it’s harmful. Dwelling on the drawbacks of the disease is a sure path to your own personal Slough of Despond, whence there is no escape. It’s like struggling in quicksand. All that effort only serves to make your descent more inevitable and more painful. There’s a reason “count your blessings” became a cliché. It’s good advice. 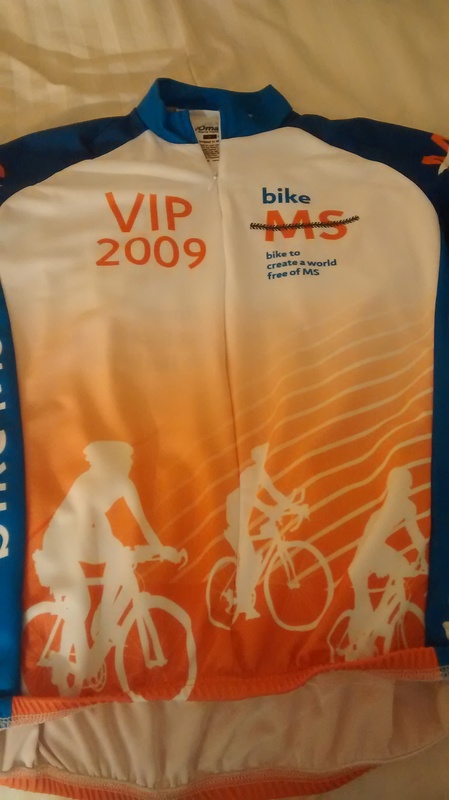 MS: It’s not just a disease, it’s a wardrobe. …T-shirts, sweatshirts, and a hoodie that is the envy of everyone who sees it. I even have MS socks. You’ve probably noticed a pattern here. 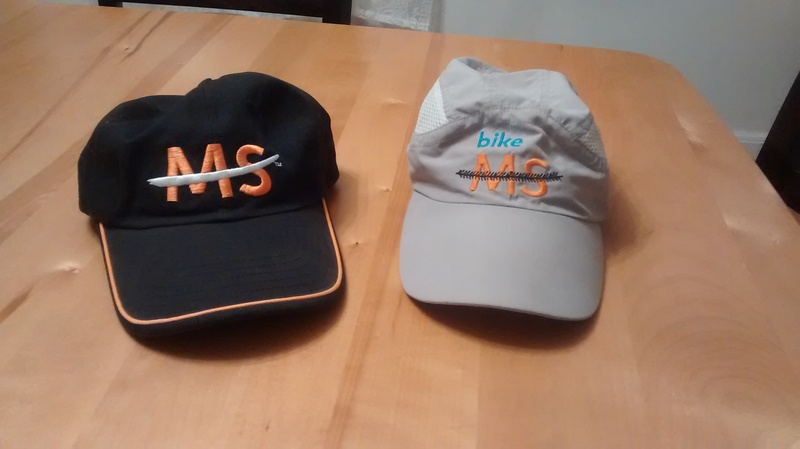 Many of these items were picked up as a result of participating (since the early 90’s) in MS Bike rides. In that sense, I earned them. Some were just picked up here or there. I even made one myself. 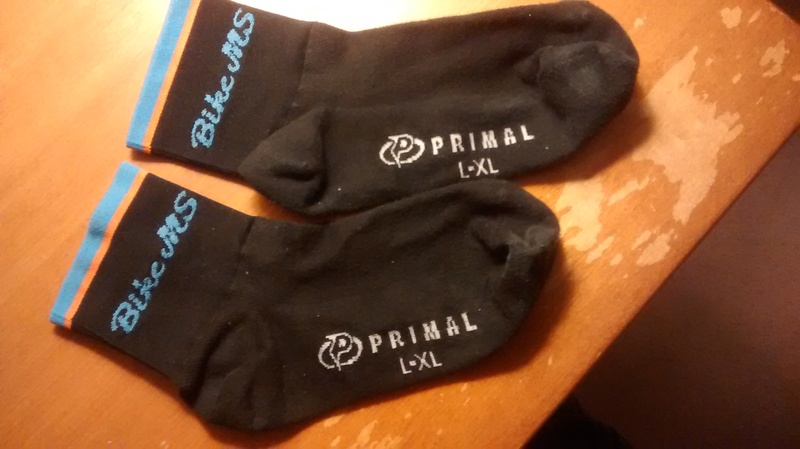 I’m not the only one and biking isn’t the only route to free apparel. 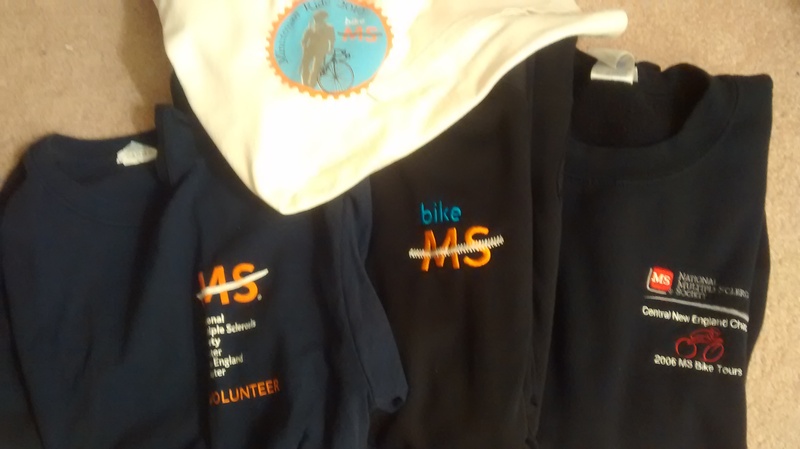 Plenty of folks have garnered garments in a similar fashion (pun intended), by volunteering at MS-related events, for instance. I don’t really need all this garb. It’s nice to know, though, should the doctors, tests, and meds bankrupt me, I’ll have a closet full of free clothes to fall back on. Of course, it would be nice to have some pants to wear. This entry was posted in MS and tagged bruce freeman rail trail, cliché, clothes, count your blessings, cycling, gloves, hats, ms, MS Bike, socks. Bookmark the permalink. Slough of Despond- great literary vision. Personally, I am jealous about the hoodie! No need to be jealous. 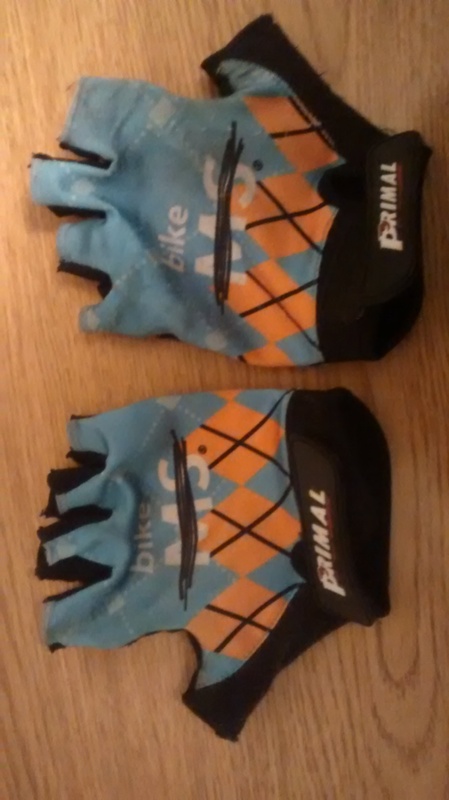 All it takes is a bike and a willingness to set aside your dignity. Then you, too, can grovel and beg shamelessly until you get such swag.